Since the protection his mother gave him stops on his 17th birthday, Order decides to shift Harry to Burrow beforehand. After a surprisingly warm farewell, they are ambushed by Death Eaters on the way, and Harry again escapes death in the form of Lord Voldemort. Reaching Burrow in the aftermath of attack, they start preparing for Bill and Fleur’s wedding (the “Just Married”s include another couple now). Minister of Magic tells Harry that the trio has inherited some items from Dumbledore in his will, Harry’s inheritance including the Snitch he caught in the first match and Gryffindor’s sword. The wedding is cut short when Kingsley informs them that Ministry has fallen to Voldemort and the trio disapperates in the midst of an attack. They start their quest a bit earlier from no. 12, Grimauld Place where they get their first clue, thanks more to Hermione’s bead bag than anything else. After a reconciliation with Kreacher, they break into Ministry (to find out the Ministry is lot more “1984”ish and rather Hitlerish than OotP the movie shows). Running after the attack, they are forced to abandon their hiding place, and from then on they start living in Jungles. Hogwarts is also taken over by Death Eaters, with Snape as headmaster. Harry starts getting flashes into Voldemort’s mind again. They are just one step ahead of Voldemort in all this, and after losing things he holds dear, Harry is hunted by everybody. Ministry isn’t overtly taken over by Death Eaters, causing confusion amongst the common wizards. 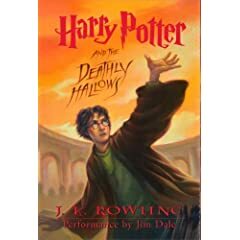 There is also a book coming out by Rita Skeeter about Dumbledore which shows the altercation between the Dumbledore brothers and showing the death of their sister, casts a lot of questions on the Dumbledore Harry knew. Unfortunately, a rift in the trio breaks it, and the two remaining members continue their quest. After a fateful journey to Godric’s Hollow, the trio is again completed and they destroy the Horcrux they are carrying. They learn about “Deathly Hallows”, three items – a wand making the bearer unconquerable in duel, a stone which can be used to summon dead and an invisibility cloak. It is said that the person who re-unites the Hallows will be master of death, and Harry knows that Voldemort is after the wand. The trail of remaining Horcrux takes them to Gringotts after an eventful journey to Malfoy Manor, from where they escape on a dragon. Lacking the means to destroy the Horcrux they have, and knowing that Voldemort has hidden a Horcrux at Hogwarts, they journey there. With the “underground resistance” (or overground since they hide on 7th floor) of Hogwarts, containing members of Dumbledore’s Army, the final battle is waged in Hogwarts. The Order and reinforcements arrive to help them. But it is with the help of a memory from dying Snape, Harry is able to vanquish Voldemort in front of whole school. The book is a lot darker, with death, relentless attacks on Harry (and his friends everywhere) and the the battle at the end. Treachery follows Harry everywhere, as he is “Undesirable no. 1” for Ministry. The Ministry also starts policies against muggleborn wizards and witches, and the resultant hostage situation makes people betray him. Harry also spends most of the time obsessed with Hallows, and trying to re-unite them. It takes the death of a close ally to shake him out of the obsession. Ron and Hermione help him with all there strength (Ron showing some surprising talents, and Hermione… well, being Hermione), yet it is he who has to face the last enemy alone. This he does with the help of two Headmasters of Hogwarts, both helping him from beyond the veil, so to speak. Other members of Dumbledore’ Army too, show their mettle and the last fight brings out the spirit in otherwise calm members of the Order. At the end, the Hallows remain un-united, a decision applauded by Dumbledore. Just a warning: Don’t skip to Epilogue directly (as some people are suggesting) in hopes to get The Answer, as it gives out everything like a good epilogue should do. Pathetic! With all the whole wide world of ear-related humour before you, you go for holey? P.S. This concludes my review of “Harry Potter” series. Few more months to go and it would be year to your reply of my comment! Sorry, just lost my way in this big world! Anyways, I am back and I am going to bookmark you. I will now dive into the archives and read other reviews. Have you read “The Secret” by Rhonda Byrne? I have it on my desk. Heard it is a good book. Try reading that.